Administrators and teachers need defensible evidence of English language learners’ growth and achievement to drive their decision making! This groundbreaking book provides a field-tested approach to accountability for ELLs. Gottlieb and Nguyen propose the BASIC (balanced assessment and accountability system, inclusive and comprehensive) model. This model is research-based and grounded in practice. It relies on multiple forms of assessment data from multiple stakeholders that yield a body of evidence on language learners’ learning and academic achievement. Gottlieb and Nguyen document how teachers and administrators in a linguistically and culturally diverse school district collaborate in the design of an assessment system for their language education programs, and they show us how educators use evidence of student performance to inform their decisions. Central to their work is the pivotal portfolio, something new in the assessment literature. The pivotal portfolio is different from the traditional portfolio in that it follows the student for the length of the student’s participation in the language education program and it contains evidence gathered by collaborating teachers of essential student learning and achievement. The text is brought to life through the voices of teachers, samples from student portfolios, and longitudinal data on program effectiveness. 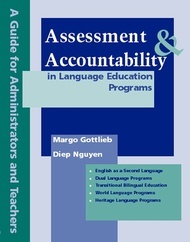 The book includes worksheets that guide administrators and teachers’ efforts to develop and implement a research-based assessment and accountability system that is appropriate for language education programs (dual language, transitional bilingual, English as a second language) in their districts and schools. This guide is ideal for study and implementation by professional learning communities (PLCs) and teacher/administrator leadership teams!